A major research focus of the GRDC National Water-use Efficiency Initiative during the first two years of the project has been on better capturing and storing rain falling during the summer fallow period and using it for winter crop production. Six of the projects within the initiative have experiments investigating the impact of weeds, stubble, grazing and/or cultivation on summer fallow efficiency (defined as the proportion of rain falling during the summer fallow period that is made available to a subsequent crop), and subsequent crop yield. These experiments have been complemented by simulation studies to determine the marginal value of summer fallow rain to winter crop production across the southern region, and to investigate the likely effects of grazing livestock on water storage and crop yield. A conceptual framework has also been developed which will allow better prediction of the effects of summer fallow management on fallow efficiency using simple rules of thumb. Work is continuing on the potential to better capitalise on stored soil water by adapting in-crop management. This article describes the experimental and simulation findings across the initiative to-date. The crop production model Agricultural Production Systems sIMulator (APSIM) was used to determine the value of summer fallow rain to winter crop production across the southern region. Locations for simulation were chosen based on the coincidence of APSoil characterisations and measured historic rainfall data. A sowing rule for wheat was used where a cultivar of appropriate maturity length was sown at 150 plants/m2 in all locations if more than 15 mm fell over a three day period during a sowing window from 25 April to 1 June. If the minimum amount of rain had not fallen, the crop was sown dry on 1 June such that a crop was sown in every year of the simulation. Two continuous wheat simulations (1889-2008) for each location were paired, with one simulation resetting plant available water (PAW) to zero at harvest, and accumulating soil water from out-of-season rainfall, the other resetting PAW to zero at harvest and again at the start of the sowing window. This mimicked a situation where poor management of weeds used all the water that would otherwise have been available for storage during the fallow. Soil nitrate in the top three soil layers was continuously maintained above 100 kg/ha so as not to limit yield, and yield differences presented here are water limited attainable yields i.e. yields attainable by growers under optimal agronomic management. Stubble from crops was fully retained (50% left standing) and no summer weeds were allowed to grow during the out-of-season fallow period. Grain yields were calculated at 12% moisture. Table 1. Mean (1889-2008) additional PAW at sowing, grain yield and water-use efficiency attributable to summer fallow rain for southern locations within the GRDC WUE initiative. Years with no return on investment are defined as years in which sufficient rain fell to germinate weeds (25 mm in a single event) but additional yield was less that 0.1 t/ha. Locations with summer fallow experiments are shaded in grey. On average, summer fallow rainfall makes a significant contribution to winter crop water-use and grain yield, particularly in the regions within the initiative studying summer fallow management (Table 1). This is particularly true in southern and central-west NSW, where near equi-seasonal rainfall distribution combined with moderate to high soil plant available water capacity (PAWC) and variable growing season rainfall results in summer fallow rain being a particularly important resource for winter crop production (e.g. Condobolin, Tottenham). The ability for out-of-season rainfall to be stored and made available to a crop as PAW is dependent on both seasonal rainfall patterns (small number of large falls vs. large number of small falls) and soil type. Heavy soil types in which rainfall events of greater magnitude are required to penetrate below the evaporative layer (e.g. comparison of soils at Morchard, Hopetoun and Bogan Gate) tend to have low fallow efficiencies (Table 1). The value of additional PAW to a subsequent wheat crop is seasonally dependent on subsequent growing season rainfall (GSR). Yield increases from good fallow management are greatest when out-of-season rainfall is high and subsequent GSR low. Because crops are often able to access stored subsoil water during critical growth periods (flowering/grain fill) additional PAW at sowing not only increases water-use, but also improves harvest index, which in turn increases water-use efficiency (Table 1). The average figures presented here tend to disguise the variable nature of summer fallow rain as a resource and the farming systems benefits that flow from having PAW at sowing (e.g. reduced risk etc). See the section below on adaptive management for further discussion of these issues. The simulations here describe the potential yield rewards from ‘perfect’ fallow and subsequent crop management (no summer or in-crop weeds, nutrients not limiting, no disease or frost) relative to a complete loss of out-of-season rainfall. In the real world, most paddocks are somewhere between these two extremes, depending on how they are managed. The simulation also ignores the nutrition and disease benefits of summer weed control, which are discussed further in the next section. Evaporative losses from fallows are restricted to the top 20-30 cm of soil, but fallow weeds are able to extract water from much deeper in the profile. Therefore, controlling weeds represents the most effective way of maximising fallow efficiency. In the regions of the study, controlling summer weeds is one of the most profitable cropping input investments that can be made, on average returning $3.53 for every $1 invested (Table 2). The simulation study described above indicates that the risk of losing money by adopting a zero-tolerance summer weed strategy is very low, with rainfall events large enough to cause summer weeds to emerge but not result in a yield increase greater than 0.1 t/ha occurring in less than 20% of years at all locations (Table 1). If money or time is limited, greatest return on investment will come from controlling weeds on soils with highest fallow efficiencies (lighter textured surface soils) or where stored soil water is already present e.g. long fallows or pulse stubbles. Table 2. Experimental results from across the WUE Initiative to-date showing the additional pre-sowing plant available water and nitrogen, crop yield and return on investment due to summer weed control. Figures in bold are statistically significant (p<0.05), figures in plain text are non significant (p>0.05) and figures in italics were un-replicated paddock-scale demonstrations. Return on investment assumes chemical and grain prices in the year of the experiment. 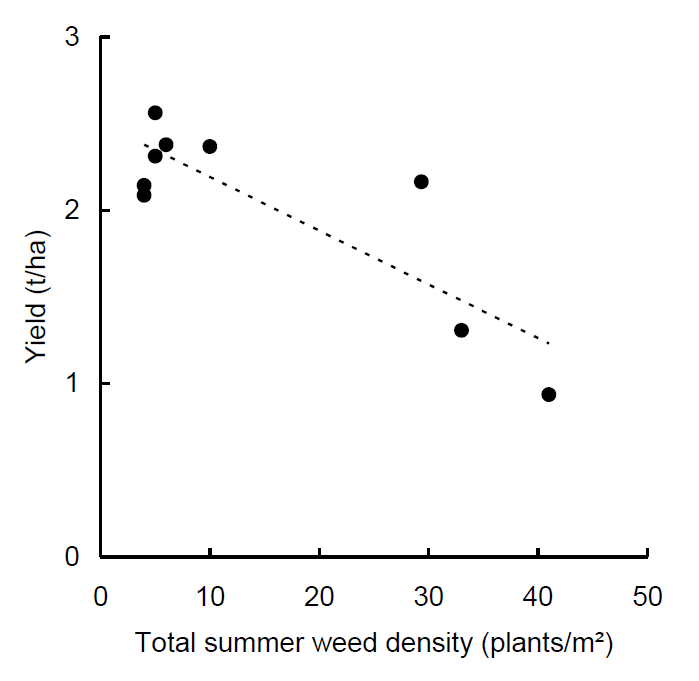 Summer weed density does appear to be important – higher densities use more water (Figure 1) and nitrogen and subsequent crop yield is reduced proportionally (Figure 2). Figure 1. Soil water depletion by different densities of common heliotrope (Heliotropium europaeum) during the 2009/2010 summer fallow period at Jil Jil, Vic. November-April rain at the site was 151 mm, error bars are the LSD (p=0.05). Data courtesy BCG & Australian Weeds Research Council project AWRC08-86 ‘Summer weeds: counting the costs for a climate-changed future’. Figure 2. 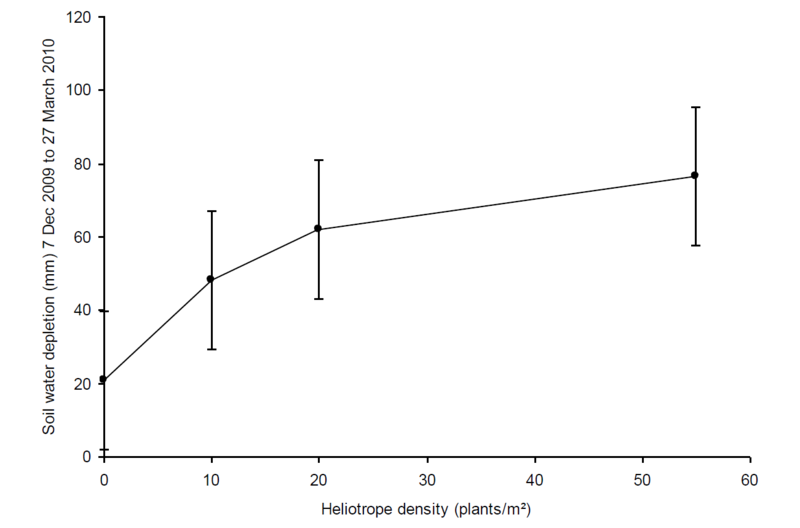 The relationship between summer weed density (common heliotrope and volunteer cereals) on 11 February 2008 and subsequent wheat grain yield in 2008 at Curyo, Vic (R²=0.72). Of the 13 experiments in the initiative studying the effects of stubble, only one found a significant effect of stubble on fallow efficiency (Table 3, Figure 3 stubble removed by grazing), one has found an effect on canola dry-matter at flowering (Table 5), and one a significant effect on wheat yield (Table 8, stubble removed by grazing). Where fallow efficiency was increased by stubble (FarmLink and CSIRO trial at Temora, NSW) it resulted from improved infiltration rates and decreased water loss through run-off during large, intense rainfall events (Table 3 and Figure 3.) No significant effect of stubble orientation (standing vs. flattened or slashed) on fallow efficiency, crop growth or yield has been found in any experiments. Table 3. Mean plant available water from 10 to 180 cm depth at FarmLink and CSIRO’s Temora field site during the 2009/2010 fallow period. Total fallow rainfall during that period was 310 mm with significant individual events of 43 mm late Nov/early Dec, 48 mm at Christmas, 18 mm early Feb, 104 mm mid Feb and 82 mm early Mar. Note: Values that are followed by different superscript letters are significantly different at a 5% confidence level according to least significant difference (LSD) statistical analyses. Figure 3. Volumetric soil water content down the soil profile at Temora of the No graze (black solid line) and combined grazed treatments (grey solid line) from Table 6 on 16 March 2010 relative to drained upper limit (grey dashed line) and crop lower limit for wheat (black dashed line). It clearly shows that the additional ~50 mm of water stored in the no-graze treatment is present at depth, implying the difference is due to improved infiltration rather than reduced evaporation.This is a caption underneath the image. Replace the image with a Sitecore media item. These results are supported by the findings of many experiments conducted in Australia during the 60s, 70s and 80s and reviewed in detail in the EH Graham Centre monograph on stubble retention cropping in southern Australia (Scott et al. 2010). In summary, the major effect of stubble on fallow efficiency is through improved infiltration rather than reduction of evaporative losses, and thus stubble is of greatest benefit where summer rainfall intensity is high and soil infiltration rates low, and on sloping country. The presence of stubble minimises the physical impact of raindrops on the surface soil, meaning that soil surface structural integrity and consequently infiltration rates are maintained, resulting in less run-off. It also slows down the flow of water on the soil surface, allowing more time for infiltration. The minimum amount of cereal stubble required to minimise run-off (and hence water erosion) on all soil types is thought to be around 2 t/ha or 70% cover on slopes up to 8%. This level of stubble cover is also thought sufficient to prevent wind erosion, and is more effective at doing this if standing rather than flattened. Stubble can slow soil evaporation following rainfall events, but if conditions remain dry for an extended period total evaporation will be the same whether residues are retained or not (Figure 4). Also, unlike weeds which can extract water from depth, evaporative losses from fallows are restricted to the top 20-30 cm of soil and hence the total amounts of water involved tend to be small. It is for these reasons that increases in fallow efficiency and subsequent crop yield attributable to surface residues decreasing evaporation tend to be minor and only occur when large amounts of residue are present (e.g. header trails, added stubble) and rainfall patterns favourable. The presence of stubble on the soil surface during the growing season theoretically results in greater net reductions in evaporation as evaporative demand at that time is lower and rainfall events more frequent (Verburg et al. 2010). This effect can lead to improved establishment following marginal planting rain, and is also thought to be the reason for the observed increase in canola dry matter production at the clay site of the BCG and CSIRO trial site at Hopetoun in 2010 (Table 5). Figure 4.The effect of rate of applied wheaten straw on the cumulative evaporation from moist soil columns at an evaporative potential of 7 mm/day over 65 days (Source: Bond and Willis 1970 © Soil Science Society of America, 2 Sep 2009 reproduced from Scott et al. 2010). Table 5. Mean canola dry-matter at 70% flowered in grouped treatments with and without stubble at BCG and CSIRO’s Hopetoun clay soil field site in 2010. In central-west NSW in 2009, wheat yield measured by NSW I&I at different positions across the header trail of the previous year’s crop showed a very clear relationship with trash distribution (Figure 5), but it is unclear by what mechanism (improved infiltration, reduced evaporation, faster emergence or all some or all of the above) this was brought about. Figure 5. Impact of trash distribution from harvest of the previous years crop on wheat grain yield of the subsequent crop in central-west NSW in 2009. Bars with different letters are significantly different from each other (P<0.05). There are two experiments within the initiative studying the impact of grazing, one managed by FarmLink and CSIRO at Temora and the other by NSW I&I and CWFS at Condobolin. At Temora, removal of stubble by sheep caused a reduction in infiltration rate as measured at the end of the 2009/2010 fallow using a drip infiltrometer (Table 6). Lack of cover rather than damage from grazing is thought to have been the cause, as infiltration rates in the un-grazed, drought-affected canola stubble (low cover) surrounding the trial were as low as the grazed treatments. The reduction in infiltration rates were detrimental to fallow efficiency (Table 3), but a very wet growing season meant that there were no significant effects on crop yield in the 2010 growing season (Table 7). However, as of 12 November 2010 the differences in PAW were still present at depth, and may affect yield in the 2011 growing season. Table 6. Infiltrometer measurements under different grazing treatments and the surrounding canola stubble at the FarmLink and CSIRO site at Temora in early 2010. Table 7. Grain yield of the canola crop (Tawriffic TTA sown 15 April 2010) sown over grazing treatments at the FarmLink and CSIRO site at Temora, and differences in PAW at canola maturity on 12 November 2010. At Condobolin, wheat yield was significantly reduced by heavy stubble grazing (Table 8), but this could not be attributed to less stored water at sowing (Table 8) or to poorer crop establishment (data not shown) and further possible causes are being investigated. Table 8. Available water prior to sowing and subsequent wheat yield under different grazing and stubble treatments at NSW I&I and CWFS site at Condobolin applied during the summer of 2009/2010. Literature describing effects of livestock on soil structure and crop yields have been recently reviewed and will be published shortly (Bell et al. 2011). To summarise, stock apply similar pressures on the soil as unloaded vehicles. Treading by livestock can reduce soil porosity and infiltration rate, and increase soil bulk density and soil strength, although these effects are mainly in the soil surface (top 5-10 cm). Despite these effects, rarely have reductions in crop performance following grazing been observed in the literature, possibly because effects are too small in magnitude or depth to influence plant growth significantly. Crop simulations with reduced root growth and surface conductivity suggest average grain yield would be reduced by < 10% in all but the most severe cases of soil damage (Table 9). The risk of compaction can be reduced by removing stock during wet conditions and maintaining soil organic matter. Because compaction from livestock is shallow it is not long-lasting and is rectified by natural processes or tillage. However, tillage operations on soils compacted by livestock may require extra draught, which will increase fuel consumption. Table 9. Simulated changes in average grain yield (kg/ha) relative to baseline scenarios due to increasing severities (mild, moderate, severe) of damage caused by livestock, including reduced root growth in surface layers, reduced surface conductivity and when both effects are combined at six locations across Australia’s mixed crop-livestock zone (Source: Bell et al. 2011). The largest and most reliable effect of tillage on summer fallow efficiency and subsequent crop yield is through control of weeds. Experiments by UNFS, BCG and CSIRO have found no difference in fallow efficiency or subsequent crop yield between chemical or mechanical control of weeds by cultivation. Relative to a soil with good residue cover, destruction of soil structure by cultivation obviously exposes soil to wind and water erosion. However relative to a bare soil (e.g. drought-affected pulse stubbles, pastures etc.) cultivated soil may be preferable as the increased micro-relief can improve infiltration and reduce wind erosion. An experiment by FarmLink and CSIRO at Temora found that tillage improved summer fallow efficiency relative to a sprayed-out lucerne pasture coming out of lucerne (Table 10), but in the wet growing season of 2010 this had no effect on subsequent crop yield. Table 10. 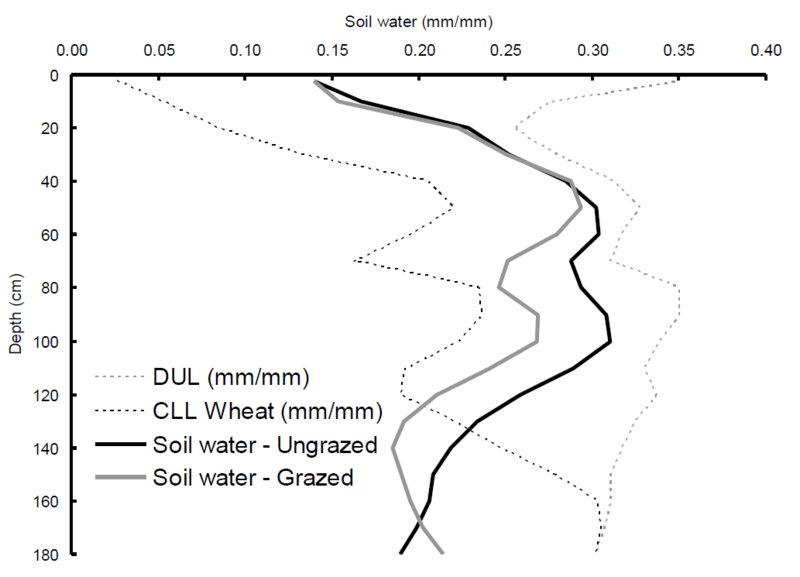 Change in soil water content and plant available water in response to different tillage treatments applied at the start of the summer fallow (30 November 2009) to a lucerne pasture sprayed-out on 18 August 2009 (i.e. bare and compacted surface soil) and subsequent wheat crop yield (EGA GregoryA sown 15 April 2010). Rather than simply considering total fallow rainfall, one approach is to consider different sequences of rainfall events – which create ‘pulses’ of soil water – to assess whether soil water will actually accumulate in the fallow period. Figure 6 indicates how different rainfall events cause pulses of soil water. This framework is being investigated to determine whether it can produce rules of thumb that allow growers and advisors to predict the likely outcomes of management on soil water storage as affected by evaporative demand, stubble cover, soil type and the sequence of rainfall. For instance if the maximum evaporative loss for a given soil type during a long dry spell is known, this essentially equates to the threshold amount of rainfall required before summer weed control will result in additional water storage. While the focus in the first two years of the WUE initiative has been on interventions to improve capture and storage of summer fallow rainfall events, work is also proceeding on management adaptations which may allow the stored PAW to be used more effectively. Complicating decision making in this area are the implications of risk and uncertainty impacting on expected outcomes. How important to final yield outcome is stored moisture at seeding in comparison to rainfall received during the growth stage of the crops? Many of the cropping areas have generally low but often erratic summer rainfall patterns and the ability to capture summer rain varies. Can seasonal uncertainty be reduced by reference to PAW at seeding? This will define the management focus necessary on summer fallow soil water capture. Can flexibility in management in response to the presence (or absence) of PAW actually achieve improved outcomes? The main focus of this research has been on lower rainfall cropping areas with highly variable crop yields. It is commonly accepted that cropping businesses in these environments incur financial losses in two to three years in ten with substantial profits also occurring in the two to three years in ten when seasonal circumstances allow good crop yields. In these districts, production risk historically has been much more important than price risk. Figure 7 shows an example of the importance of PAW at seeding on crop yields at Port Germein in the Upper North of SA. This APSIM simulation of crop yields from 1900 to 2009 on a loamy Mallee soil in a low rainfall cereal cropping environment assumed full summer weed control, direct drilling wheat at the break of the season and no nitrogen restrictions to crop growth. Simulated crop yields are effectively water limited yields- no allowance was made for potential yield impacts of other factors such as weeds, diseases or frost. Modelled data indicates that under a zero tolerance summer weed control policy, differences in plant available water at seeding would have had an important influence on historical crop yields. The combination of low PAW (and late seeding) rarely produces a favourable outcome with most yields in the lower tercile. At the other extreme, poor crop yields (in the lowest tercile) are rare when PAW at seeding is categorised as high. Figure 7. Effect of variations in PAW and seeding opportunity on percentage of modelled yields in upper tercile (white), middle tercile (grey) and lower tercile (black)-loamy mallee soil at Port Germein, SA (Source: Mudge & Whitbread 2010). While this loamy Mallee soil type is quite efficient in the capture and storage of summer rainfall, analysis of simulations conducted on less responsive soils provides similar results. Table 11 shows results from a simulation on a heavily textured, constrained clay loam at Quorn in SA’s Upper North. Again it demonstrates the poor odds (about 1 year in 10) of achieving good crop yields (above 2 t/ha) when starting with below median PAW at seeding versus odds of better than 6 years in 10 when starting with above median PAW. The important conclusion from this analysis is that seasonal outcome can, at least to some extent, be predicted early in the season based on available indicators. The analysis can provide important information on local ‘trigger points’ to drive responsive or flexible decision making. The trigger points will change for different locations and soil types and analysis of localised data is required to ensure robust outputs. Varying crop area and type. Different crops have different response curves to the presence or absence of PAW at seeding. Complexity is added by considerations of local environment, rotations, management capabilities and constraints, longer term seasonal variability etc. Adjusting the ratio of crops and livestock within season. Implicit to altering livestock levels is the development of feed-lots or robust exit strategies for livestock enterprises in the face of adverse seasonal conditions. Changing varieties. The presence of PAW provides the option to use shorter growing season varieties to reduce the possible effects of spring heat shock on final yields. Implications to frost risk need to be assessed. Time of seeding. As with changing to a shorter growing season variety, earlier seeding may allow better utilisation of stored soil moisture. In any event, timeliness of seeding and crop establishment is critical. Closely related are methods to improve crop establishment under marginal (or deep) soil moisture levels in autumn. A novel approach to this is the use of long coleoptile wheat varieties to allow deeper planting (110mm) into stored soil moisture (Kirkegaard and Hunt, 2010). Changing crop nutrition and pest and disease management in response to PAW. Techniques are already well covered by conventional agronomy. Tactical fallow in the absence of PAW. Involves accepting the seasonal risk in the current year and trading this off against the seasonal uncertainly of the following year. The project aims to refine local and/or general ‘rules of thumb’ to guide decision making in adaptive management. Bell LW, Kirkegaard JA, Swan A, Hunt JR, Huth NI, Fettell NA (2011) Impacts of soil damage by grazing livestock on crop productivity. Soil and Tillage Research, in press. Kirkegaard JA and Hunt JR (2010) Increasing crop productivity by matching farming system management and genotype in water-limited environments. Journal of Experimental Botany 61, 4129-4143 (http://jxb.oxfordjournals.org/content/61/15/4129.full). Lawson C, Sadras VO, Hooper P, McDonald G (2010) What influence does summer rainfall and stubble retention have on wheat production in Southern farming systems? In 'Food Security from Sustainable Agriculture: Proceedings 15th Australian Agronomy Conference', Lincoln, New Zealand, November 2010 (http://www.regional.org.au/au/asa/2010/crop-production/soil-water/7337_lawsoncs.htm). Mudge B and Whitbread A (2010) Making better decisions about crop rotations in low-rainfall environments: should stored moisture and the timing of the seeding opportunity influence this decision? In 'Food Security from Sustainable Agriculture: Proceedings 15th Australian Agronomy Conference', Lincoln, New Zealand, November 2010 (http://www.regional.org.au/au/asa/2010/crop-production/sequence/6994_mudgeb.htm). Verburg K, Bond WJ, Hunt JR (2010) Variable soil water accumulation under fallow management: Explanation using a pulse paradigm. In 'Food Security from Sustainable Agriculture: Proceedings 15th Australian Agronomy Conference', Lincoln, New Zealand, November 2010 (http://www.regional.org.au/au/asa/2010/crop-production/soil-water/7177_verburgk.htm).